Metal cylindrical DC 2-wire type. The 2-wire design reduces the time spent wiring to two thirds of that with the conventional 3-wire design. In comparison with the current consumption of 10 to 20 mA with the 3-wire design, the 2-wire design consumes a current only at 0.55 mA or less when the output is OFF (Leakage current), achieving power-saving. A longer operating distance allows easy settings. The operation indicator is viewable from 360 degrees, allowing easy adjustment when installing the sensor. DC 2-wire/3-wire and AC 2-wire types are available. Includes the normal close type, which is off when detection takes place and on at all other time. The APS-M Series low-priced front face sensing proximity sensors are also available so that you can choose according to your purposes. From an ultra-thin design to an operating distance of 10 mm, wide-ranging rectangular types are available to meet diverse requirements. A wide operating distance of 4 to 15 mm supports diverse purposes. A drip-proof unit with an IEC IP67 protection rating comes with a robust and oil-resistant PBT resin case. The ultra low price of 880 yen helps reduce the cost. Includes the normal close type, which is off when detection takes place and on at all other times. 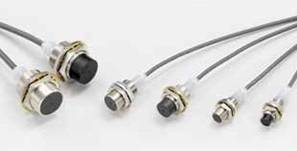 The APS-S Series low-priced upper face sensing proximity sensors are also available for you to choose according to your purposes. The large LED display is so clear when viewed from different angles that it is simple to check the operation and to perform adjustment at the time of installation. The 2-wire design ensures simple wiring. It supports both sink and source loads. The CS Series is available in a number of different types-including the CS-31 Series resin cylindrical models and the CS-16 Series rectangular models-so that you can choose according the purposes. The CS Series is available in a number of different types-including the CS-85 Series metal cylindrical models and the CS-16 Series rectangular models-so that you can choose according the purposes. The CS Series is available in a number of different types-including the CS-31 Series resin cylindrical models and the CS-85 Series metal cylindrical models-so that you can choose according the purposes.